Another new face to the Listener this week, although she (I feel sure Chalicea is a she!) has an Inquisitor and an EV later this month, not to mention a Magpie, and none are [oops!] a first appearance. Just 15 misprints to find in this week’s puzzle, a letter omitted from some wordplays, and then a bit of highlighting and line drawing at the end. The puzzle’s title is one of the Phrases and quotations from foreign languages at the back of Chambers, and is given as Latin for “but hope is not yet crushed” (although I’m not sure where the “yet” comes from). That didn’t help much at all. I resisted the temptation to google “anniversaries June 2013”. 1ac Japan accepted an Indian copper was JAWAN with the W omitted from the wordplay. A speedy solve seemed ahead of me. A few minutes later, after my first pass through the clues was complete, I wasn’t too sure, as some clues which looked straightforward, obviously weren’t. I put it down to the missing letters and misprints. Luckily, among others, SHIV SENA, GNARLED and AVOWABLE across, plus MAAING, ETNAEAN and VEENA down gave enough of a start for me to be reasonably optimistic. After my third clue where the wordplay omitted a W, I wondered if the World Wide Wide was the theme. The fourth was also a W, and the fifth, and… Well, I guess you’ve been there, so you know that there were nine Ws omitted from the wordplay, and they affected fourteen clues. The clues were solid, but I think my fellow blogger, Shirley, would have been quite suspicious of Chalicea (!) as she has no alcoholic ‘tipples’ anywhere in her clues. Indeed, she positively eschews the stuff with 6dn Stink about Alcoholics Anonymous sounding nannyish and 31dn After dinner drink, local tea, assuming not out of date, although the answer here was, indeed, a type of port not a pot of tea! My favourite clue was 12dn Takes away the pips from close of BBC in heartless acts which conjured up the nightmare of the rights to the time signal being taken away from Radio 4. 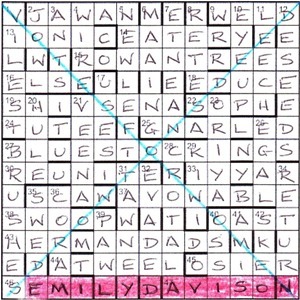 The correct letters of the misprints spelt out Cherchez la femme, and there was EMILY DAVISON in the bottom row. Of course, I didn’t immediately spot ANMER in the top row since my knowledge of the Derby is minimal, despite being born and raised in Epsom. A bit of research and he was spotted, and a double-check showed him to be a him (a colt in racing parlance), whereas Emily Davison was definitely a woman and was the ‘character’ that needed highlighting. Well, given the theme of the puzzle, it had to be her really. I wasn’t too sure of the thematic reason for dropping the Ws from the wordplay, even though they obviously meant Women. I guessed it was because they weren’t allowed anywhere near the ballot box. Finally, two phrases had to have lines drawn through them “as demanded by one of the characters and other 27ac”. 27ac, unclued, was BLUESTOCKINGS. The two main daigonals were the obvious places to look, and VOTES FOR WOMEN and DEEDS NOT WORDS ran the whole length of each. Two lines through gave them the vote in the form of a cross. We finally had a grid packed with thematic entries and images that must have been tricky to put together. An excellent puzzle, so thanks to Chalicea. This entry was posted on 21 June 2013 at 3:58 pm	and is filed under Solving Blogs. You can follow any responses to this entry through the RSS 2.0 feed. You can leave a response, or trackback from your own site.